Outsourcing BPO Services to India is one of the popular business practices in today's competitive environment. The Indian BPO industry is constantly growing. Outsource to Outsource2india and benefit from our world-class BPO Services. British Trade and Industry Secretary, Patricia Hewitt, at a national conference of the Confederation of British Industry (CBI) said, "It is much easier to see the short term benefits of protectionism than to see the long term costs to consumers and business competitiveness." This is the crux of the pro-outsourcing argument. Outsourcing BPO Services to India offers benefits not only in terms of cost reduction, but also in terms of increased productivity and quality. Companies along with their customers benefit since they can access some of the best talent and expertise in the industry at lower rates. Outsource BPO services to Outsource2india and benefit from high-quality and cost-effective services than can increase your productivity and revenue, while reducing your expenses. Bob Beauchamp, BMC Software President and CEO talked about the backlash in the US where an economic rebound had not created jobs. Addressing the Product and Embedded Software Summit in Bangalore he said that there may be a backlash, "But as studies have indicated that for every one dollar invested in India, the value derived by the US economy is between $12-14." He termed outsourcing to India as "irreversible" and said it was a "must have" to improve the Indian and global economy. Cost is and has always been a driving factor for businesses, that's also one of the reasons why the rise of rural BPOs in India has been stupendous over the years. NASSCOM has tried to address some of the concerns voiced by anti-outsourcing parties especially about the benefits to the American economy. The study shows that US businesses have witnessed significant cost savings by offshoring to India. American BFSI companies have saved $6 billion in the last four years by offshoring to India. 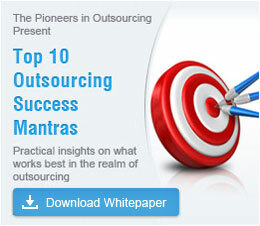 Outsource BPO services Outsource2india and experience tremendous cost savings! It seems contradictory to say that the migration of jobs from one country to another actually creates jobs in the former. However, that can ultimately be the case. According to the NASSCOM report, the BFSI sector have saved $6 billion in the last few years and due to these savings have added 125,000 new jobs in this period thus preventing layoffs. Nearly 170 Indian IT companies have offices in the US and they employed nearly 60,000 people in the US in 2001. These people paid nearly $810 million in taxes in 2001. Employees of Indian IT firms bought goods and services worth $1.2 billion in the US and paid nearly $300 million as social security in 2001. The NASSCOM study continues to explain the added benefits. BFSI offshoring has resulted in quality and productivity gains of 15-20% and customer satisfaction of almost 85%. The report gives a striking example of the success of the automobile industry in the US due to outsourcing. Today, this industry is the largest in the world and two of the biggest automobile companies are American. The industry has the same number of professionals it did in 1994 as it did in 1974, which is 900,000. Over this same period sales and services in this sector grew 20% from 2 million to 2.4 million. Outsourcing gave this industry a competitive edge and opened up opportunities in terms of investing in new equipment and re-engineering processes. The US steel industry, however, resisted outsourcing and suffered greatly despite several tariffs and quotas. Amidst the mounting furor against outsourcing one has to examine things more objectively. In the short term, cost benefits and value addition may not be apparent because of the initial investment involved in training and infrastructure. Also outcries against migration of jobs seem to cement the argument. However, as the NASSCOM report shows, the long term benefits are very powerful. Not only does outsourcing BPO to India allow global companies to avail of some of the best talent and expertise at competitive rates, but it also allows the company to actually save several jobs, which it might have had to lay off otherwise. Minimize your operating costs and maximize your revenue by outsourcing your BPO services to Outsource2india. O2I offers high-quality BPO services that can add value to your business and increase your productivity. Outsource BPO services and save on time, effort and manpower. You can also get access to expert, skilled and specialized BPO services. Outsource BPO services to Outsource2india and give your organization a cutting-edge!